The large floral trend has been one of the biggest I’ve seen in a while, no pun intended! I think one of the reasons they are so popular is because it allows us to utilize florals in a way that doesn’t feel like Grandma’s house (not that there’s anything wrong with Grandma’s house). The new floral decor is big, bold, modern and fresh. It doesn’t have to adhere to a repeating pattern, a certain color scheme, or a traditional style. I came across some absolutely stunning floral photograph prints that I instantly knew I had to add to my online shop. The images in this post show them blown up into large print sizes, but they are also available in small sizes if you’re not ready to take the leap into oversized art. I love how floral art can look amazing in a traditional space, but also in a modern space. 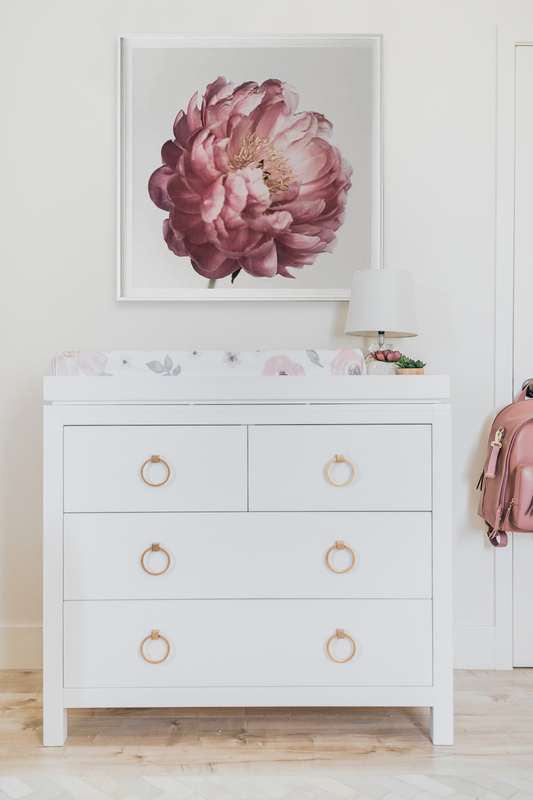 In the nursery above, the whole room is clean and modern, but the stand-alone Bright Pink Peonies Print brings life and color into the space without it feeling overly girly or traditional at all. 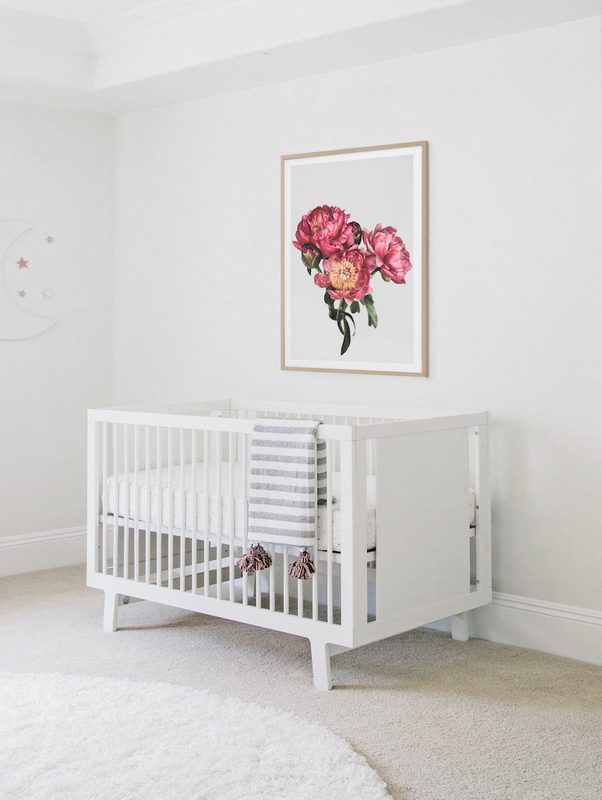 A simple frame is a must for a space like this, but an embellished frame could really make a statement in a more glamorous nursery. 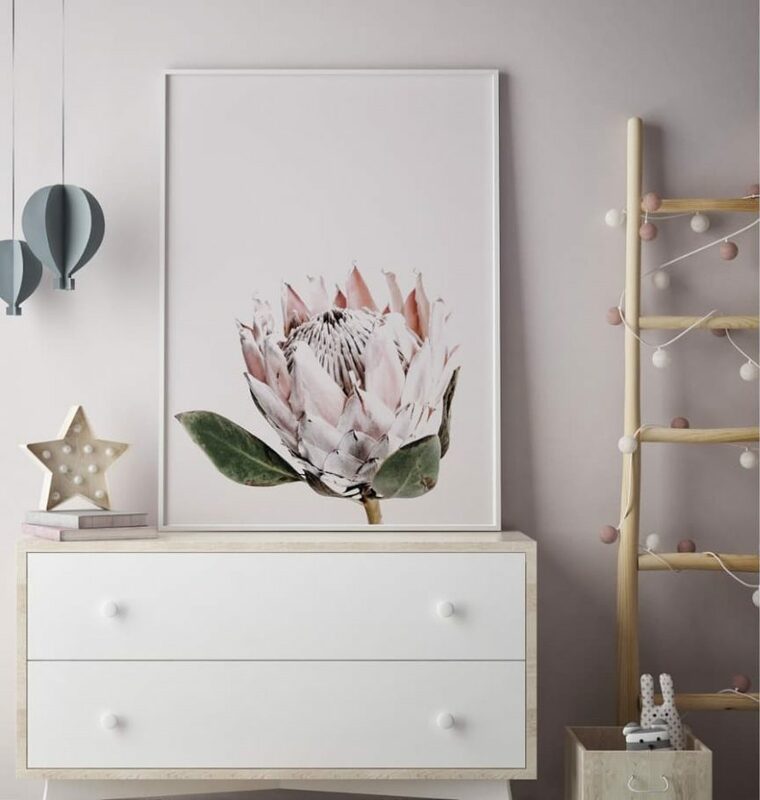 The above image of the Pink Protea Floral Print is my absolute favorite photograph in this collection. I love how soft and delicately moody it is with the very pale pink background. This piece is so feminine! 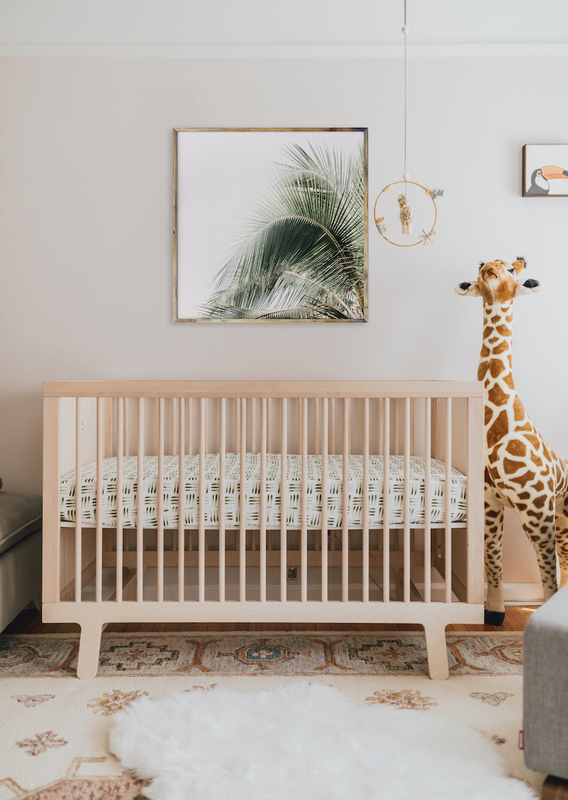 The best part of this whole collection is that they will all totally work in a nursery or kid’s room, but they are so versatile that they will transition into a teen room or adult space making them worth the investment! If I had this floral photo on my wall, I would never take it down. Lifetime art! OK, so this one isn’t floral, but it’s from the same collection and it’s just as beautiful! 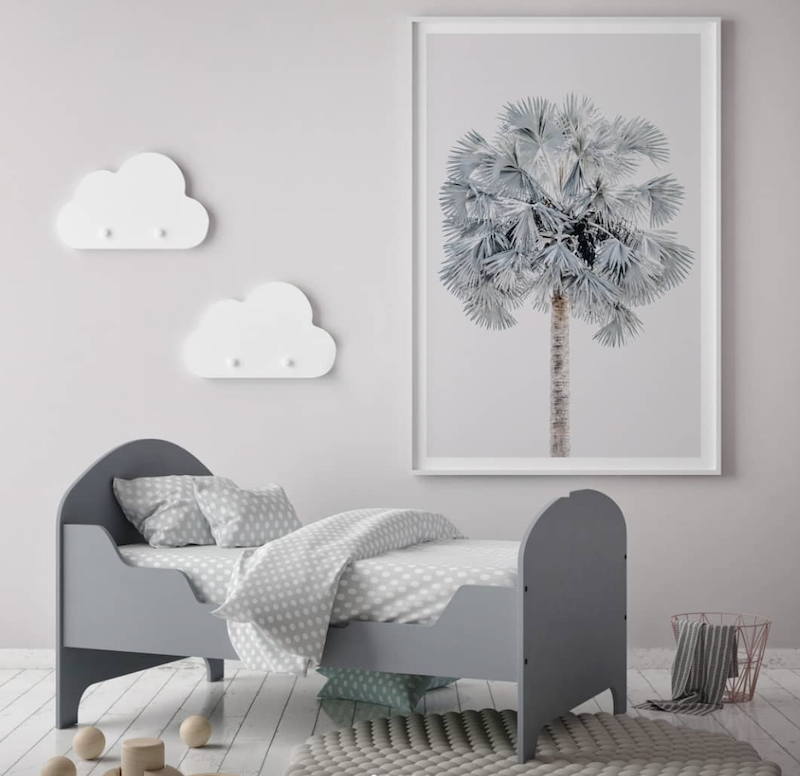 If you’re not in need of a floral print for a girl’s nursery, the Palm Tree Print is perfect for a neutral or boy’s space as well. It’s breezy, bohemian and modern. Need a serious statement-making piece? 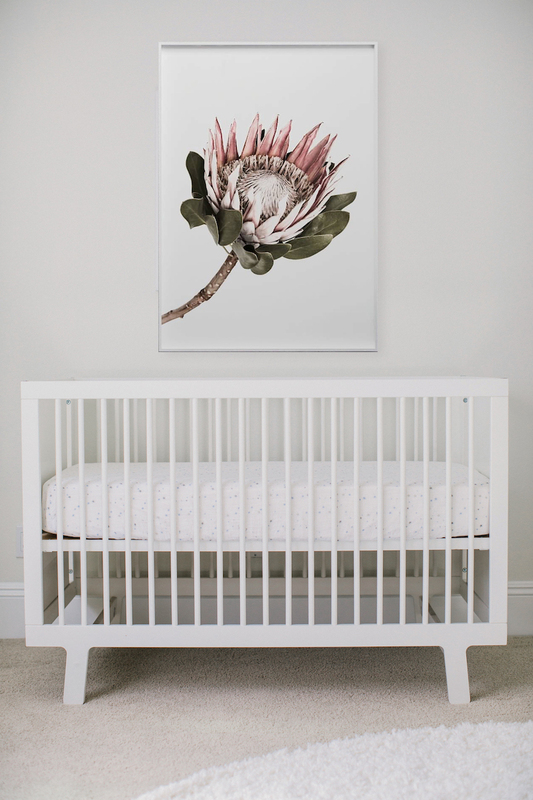 The King Protea Floral Print is so simple, yet says so much. This one can also be dressed up or dressed down for a modern or a traditional space. There’s one more that’s not floral, but rather another palm tree photograph. I love the hazy blue color of this print! This piece is perhaps the most versatile of all of them. It can go in a boy’s nursery, girl’s room, playroom, adult bedroom—pretty much anywhere. No matter where you live, you can bring in a little coastal vibe with the Blue Palm Tree Print. You can shop the whole floral print collection in my online shop!